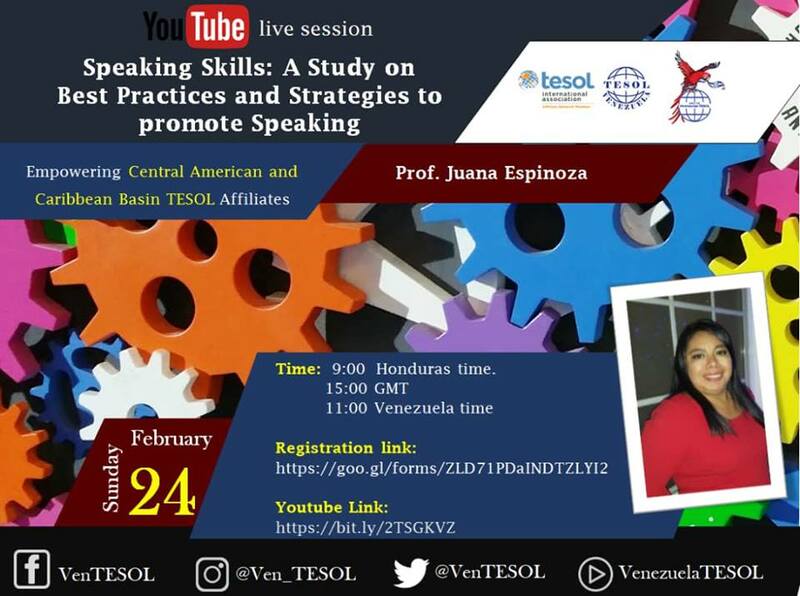 Venezuela TESOL (VenTESOL) and the Central American and Caribbean BASIN TESOL Affiliates cordially invite you to the “Speaking Skills: A Study on Best Practices and Strategies to promote Speaking” Youtube live session. Interested in learning how to instill confidence in your beginner learners when it comes to speaking? Then this webinar is for you. Through this webinar you will learn best practices to use in the classroom to promote speaking skills through a variety of proved techniques and strategies that have been successful in the beginner classroom in a Latin American context. Juana Espinoza de Ayestas has a graduate degree in TESOL from the National Pedagogical University. She has been an ESL professor since 2009 and is a US Embassy accredited teacher trainer since 2008 as well as a certified trainer of trainers since 2010. Presenter at TESOL 2011 and 2014, Mexico 2010, Costa Rica, Panama and Perú. She has delivered several presentations at HELTA TESOL Annual conferences and a webinar through EFLTalks. She is currently an ESL professor at Zamorano University working on the development of communication at the beginner and intermediate levels. She is at present HELTA TESOL treasurer and has volunteered in as regional academic coordinator during the last four years. If you need extra help checking your local time, we invite you to visit www.worldtimebuddy.com so you can compare your time with any of the ones offered on the schedule. Lamentamos profundamente el fallecimiento de Milo, nieto de Cielo Molina. Nuestro afecto y acompañamiento a nuestra querida colega y colaboradora de ARTESOL de tantos años.